Need affordable web hosting that delivers exceptional customer service? Read our review of Tsohost before you make your choice. When it comes time to pick a web hosting provider, the decision typically comes down to a few factors like reliability, cost, and quality of customer support. We took a look at Tsohost to see how it stacked up against those three factors (as well as the competition) and found that it does a very good job in meeting all three of those criteria. If you’re thinking about signing up, here is what you should know. What is Tsohost Customer Support Like? What are Some Good Alternatives to TsoHost? How do I choose between Linux and Windows, and what is TsoHost’s “Hybrid” mode? How do I find out about status issues with TsoHost? The actual name of this web hosting company is Paragon Internet Group. However, for the sake of brevity, it conducts business under Tsohost. So don’t be confused if you find references to both names on the website. Regardless of what you want to call the company, Tsohost has been in business since 2003 when it was established in London with the goal of providing cheap and reliable internet services. A half a million websites are now hosted by Tsohost. Built on world-class infrastructure, Tsohost offers a comprehensive range of web hosting services. Tsohost has received an average customer rating of 4.9 out of 5 stars, based on a total of 678 reviews. As you can imagine, a company like Tsohost doesn’t want to limit what its customers can do. This means offering a wide array of web hosting options. Tsohost’s shared web hosting plans are actually all in the cloud, which makes these an even better deal than what you’d get with traditional shared hosting. MySQL, PHP, Perl, and other standard programming and database tools you’d need. One thing to pay attention to with these plans is pricing. While they are indeed cheap — much cheaper than what you’d find elsewhere for cloud hosting — the premium plans come with a custom domain. So, if you’re also planning on buying a domain from Tsohost, it might make the upgrade worth it. Video above: TsoHost’s YouTube channel features a playlist of cloud hosting tutorials, like this one. They also come with a proprietary control panel tool which offers more options than cPanel and is makes cloud tasks simple. In the next step up, Tsohost offers managed virtual private server hosting for Linux and Windows. This means you’ll have more control over configuring your server, but that Tsohost will take care of managing things like security, OS support, uptime, and the software firewall. These plans also come with a free setup as well as 24/7 technical support. How does TsoHost serve small business? Browse the TsoHost YouTube channel for interviews with customers, like this one with Laurence O’Toole, founder and CEO of Analytics SEO (now called Authoritas). Now, this isn’t something you typically see offered by web hosting companies, so it’s nice to see this option from Tsohost, a company that prides itself on its in-house technical experts and support. Complex hosting plans offer customers the ability to work one-on-one with a systems engineer to build a server environment based on your requirements. If you need the ultimate performance from your website and can’t afford any downtime, this might be the option you need. Tsohost also assigns a dedicated account manager and team to customer accounts, so that any issues that arise are immediately handled by someone familiar with your site or app. Tsohost offers a single “one size fits all” hosting plan for resellers. It can host up to 100 sites and developers and agencies have the ability to white-label the backend. Here is an example of another standout hosting option from Tsohost. This one is solely meant for UK-based charities. In return for publishing a small Tsohost banner on their websites, charities will receive free hosting from Tsohost. It’s nothing major, but it should be more than enough for what a nonprofit would need. Tsohost breaks out a number of different content management system “hosting” pages on its website. However, if you see an option for WordPress hosting, it’s no different than cloud hosting. The same goes for Joomla hosting. There are no additional fees and you still have the same one-click installation that gives you access to those content management system apps. Pay attention to are Ghost, PrestaShop, Magento, and forum hosting. The corresponding app is not integrated with its platform and you’ll have to pay separately for them. WordPress users who want a hosting plan that asks for minimal fuss from them should consider Tsohosts’ managed WordPress options. You will also get nice bonuses like a free SSL certificate and free website backups every day. All Tsohost plans support one-click WordPress installation, but if you ever have any issues, the Tsohost staff is available to help 24/7. This assistance covers things like website migrations in addition to general tech support. If you are interested in launching an online store/e-commerce shop, Tsohost might be a good fit for you. The company’s web hosting packages could undoubtedly be used to support whatever platform or shopping cart you have in mind, but it also offers Magento- and PrestaShop-specific plans. There is, however, no specific benefit the company offers to e-commerce sites; its focus is on generalized web hosting. Most Tsohost packages that include a control panel for web server management and administration ship with the cPanel Control Panel, one of the leading options in the industry. If you have used cPanel before, the interface will be familiar to you (Tsohost does not implement any in-house modifications), but if you have not, the learning curve for this product is not too steep. Switch between Linux and Windows or use “hybrid” mode to run ASP and PHP sites from one dashboard, or run sites that contain both PHP and ASP code. When you’re looking for a web hosting company that promises reliability and can deliver on it, you might want to start your search with Tsohost. Tsohost refers to its network as “True Cloud Hosting” since no one location is ever relied upon to power its customers’ websites. Failover and reliability don’t stop there either. Websites run on diverse, multi-homed networks with fiber optic Gigabit connections. This means that multiple providers power the connections, ensuring that internet service is never disrupted. Cisco and Juniper are responsible for providing Tier 1 transit, equipment, network firewalls, routing, and switches. This ensures that Tsohost’s network and hardware are consistently secured, fast, and reliable. Because of these contributing factors, Tsohost’s uptime guarantee is 99.9% for shared cloud hosting. For virtual private, dedicated, and complex hosting customers, they additionally receive a 100% power and network uptime guarantee. Video above: TsoHost demonstrates the resilience of their infrastructure. This video provides an overview of their power distribution and generator backup provisions. Tsohost’s server facilities are secured and monitored 24/7/365. Only authorized personnel have access through biometric scanning to the data servers. Linux and Windows web servers come with the latest Dual Hex (6) Core Xeon processors from Dell. Email and service servers are physically secured away from Tsohost’s web servers. Storage and backups are also kept away from the web servers in order to ensure uptime and security. Fire suppression: Tsohost is using an advanced system called Inergen Fire Suppression. This gaseous product is designed for server environments, does not damage equipment or create toxins. The facility is ringed with 3-meter high fencing. Over 25 CCTV cameras are deployed. It’s clear that Tsohost has taken great pains to provide a stable and reliable base for customers to rely upon when hosting their sites here. Domains: you can register a domain with or transfer yours to Tsohost. They have hundreds of extensions available; the UK extensions being the cheapest available. Managed firewalls: if you want more than just the standard software firewall that comes with the managed VPS plans, you can upgrade to shared or dedicated hardware firewalls. SSL certificates: there are a few options available for standard and premium certificates. Video above: Get an overview of how TsoHost’s DIY site builder works. We’ve established that pricing for Tsohost’s services (especially cloud hosting and domains) is reasonable. We’ve also shown that the infrastructure lends itself well to providing a reliable and high-performance experience for customers’ websites. Status Center that provides information on the current/ongoing server or network issues. Need help starting a blog? 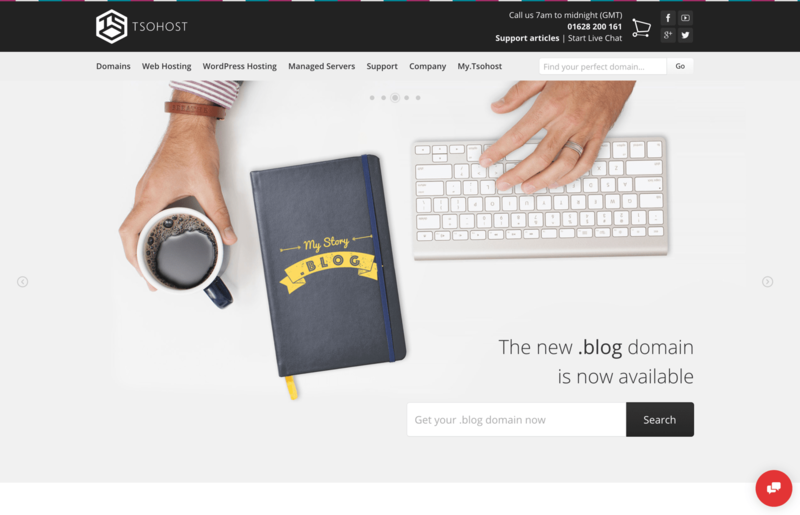 Tsohost offers step-by-step guidance, like this video on how to create a blog with the Ghost platform. First, if you’re a strong user of WordPress, here are some available alternatives. Power users of WordPress might look to WP Engine instead, which is a high-end, managed WordPress installation. WP Engine is definitely not a host that is right for someone just getting starting, but for someone with a robust website seeing higher levels of traffic, WP Engine’s managed web hosting plans might make web hosting much simpler. Whether SiteGround is an alternative to Tsohost depends on your needs. So, the fact that Tsohost is not on the list while SiteGround is, probably does not matter much to you. Both Tsohost and SiteGround are more than capable of supporting WordPress adequately, so the criterion you should probably use is whether you want a managed solution or not. If you want to do it all yourself, then SiteGround is probably the way to go. If you want more hand-holding, Tsohost is the host for you. Alternatives to Tsohost that are more beginner-friendly include Heart Internet and HostGator. Both offer a variety of web hosting options backed by around-the-clock support. If you are looking for a more localized presence in the UK, Heart Internet is a good option. If you are looking for a more global-oriented alternative, check out HostGator. It’s quite clear that Tsohost’s decade-plus working as an Internet service and web hosting provider has taught this company a lot. Its infrastructure is top-of-the-line, its web hosting plans offer customers every option they could possibly want, and its support covers customers from all angles. It doesn’t matter what size your business or website needs are. Tsohost has a very reliable set of services to work with — all dedicated to giving customers the peace of mind to focus on managing their websites and not worrying about what’s happening behind the scenes. Here are a few common questions asked about TsoHost. TsoHost is owned by Paragon Internet Group, Ltd.
Paragon was acquired by Host Europe Group (HEG) in 2015, and now operates as a subsidiary of HEG. Linux Linux is recommended if you’re using PHP-based applications. Common examples include Drupal, WordPress, Magento, Joomla, Yii, and CodeIgniter. Windows Choose Windows if you will run ASP/.NET based software. Examples include Sitecore, DotNetNuke, Umbraco, and Kentico. Running PHP through Windows, while possible, is suboptimal. Hybrid TsoHost’s Hybrid mode will enable you to run PHP and ASP simultaneously. Your PHP code will run through their Linux cluster. Your ASP code will run through their Windows cluster. This means you can run PHP and ASP code on the same sites, and from a single dashboard. TsoHost adds: “The bias determines whether code other than PHP/ASP (ie raw HTML) is run through Windows or Linux. Visit their Status Center. In the left-hand margin you’ll see categories to search for current status of service. You will also find a list of incidents and announcements of any upcoming scheduled maintenance. To report an incident you can raise a new support ticket or call them at their U.K. number. If you’ve detected what you believe to be a security vulnerability, use the TsoHost Report Security Issue form. In addition to reading reviews, here are some ways to determine this for yourself. Read customer reviews. The TsoHost website states that they have “an average customer rating of 4.9 out of 5 stars, based on a total of 678 reviews.” Browse the web for other sources of customer reviews. Browse the TsoHost site for testimonials from customers. If you are a small business owner, you may want to contact one or more individuals featured in the videos to get an updated (current, 2018) assessment from them of TsoHost’s performance. Consider your geographic location. Realize that TsoHost phone support operates on U.K. time. Does that work for you? Hungry for more information about Tsohost? Click over to our sister website, WhoIsHostingThis.com. It’s got answers to frequently asked questions as well as over a dozen reviews from actual Tsohost customers. What are you waiting for? You are here: Home > Web Hosting: Which Hosting Company Is Best For You & Your Website? > Tsohost Review: Does This Host Stack up Against Their Top Competitors? Previous: SiteGround vs HostGator Comparison: Two of The Biggest Names in Hosting Battle it Out. Who Wins? Next: WebHostingPad Review: How Hassle-Free Is Their Hassle-free Hosting, Really?